(Fits the New 2016 & 2017 Mini Console Versions of Super Nintendo and Nintendo Entertainment System). These are not for the old original cartridge based systems from the 80's and 90's, and are not for 3rd party replicas. While most people refer to the mini consoles by their abbreviated names of NES MINI and SNES MINI for simplicity, note that Nintendo will not use their abbreviated names on the box, and will instead use their full names. The UK and European versions of the mini consoles were all given the series name of Nintendo Classic Mini, which will also be written on the front of the box. 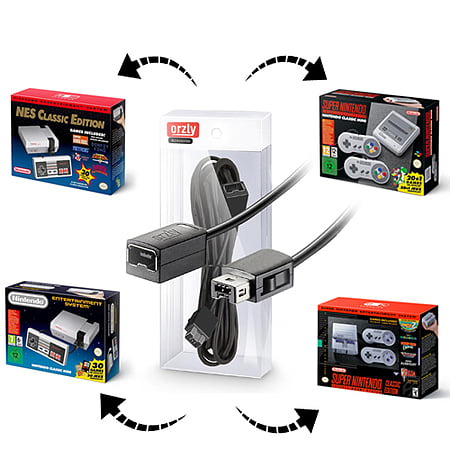 So if you look at the box that your console came in, if it has either the words Classic Edition or Nintendo Classic Mini on the front of the box, then these Orzly Extension Cables will fit your console! *PLEASE NOTE: THE CONSOLE AND CONTROLLERS SHOWN IN IMAGES ARE FOR COMPATIBILITY DEMONSTRATION PURPOSES ONLY AND ARE NOT INCLUDED WITH THIS PRODUCT. 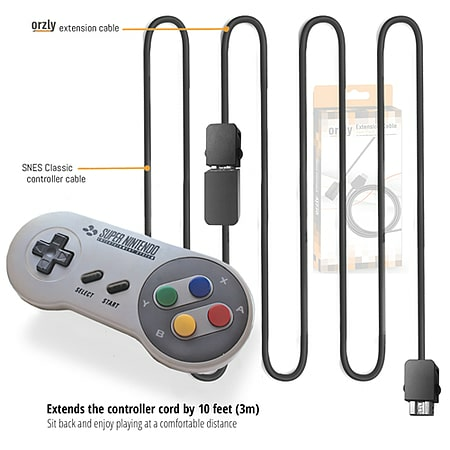 (This Pack Contains 2 extension lead cables for extending the length of your controller).